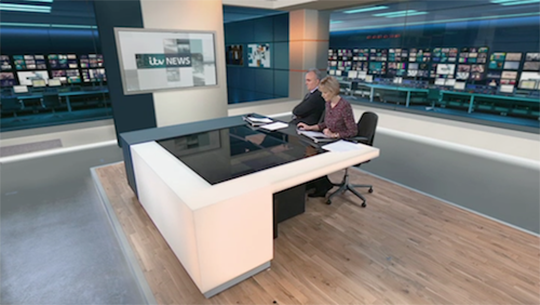 We recently talked with BDA Creative’s Simon Jago about the ITV News project, which included two national sets and 10 refreshed regional sets. As part of ITV’s major channel rebrand, BDA were invited to re-design the two national sets (London, and Salford – due to launch in the coming weeks) and refresh the 10 regional sets. 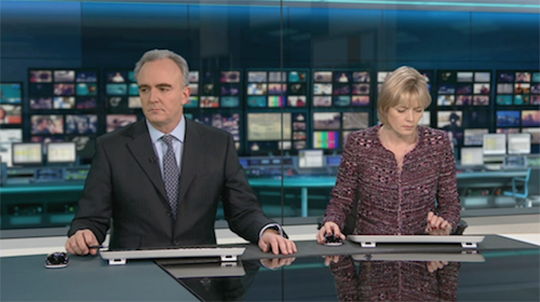 The national news set in London is used for the London, Lunchtime and Evening News and Current Affair output. What was the client’s specifications? Set to be built around the anchor/presenter at the helm (main focus), to create a familiar connection with the viewer. 2 national sets and 10 regional refreshes. Core idea at the heart of ITV News is the commitment “to bringing the audience the full story”. What goes into designing a virtual environment compared to a hard news set? In this instance the process was similar to designing a real set as we were trying to create a real environment. Some of the space constraints were different – our virtual space could be any size! This design is very different and “grounded” in reality, compared to the past design. What brought about this decision? Do you think faking reality is a good design move? The design echoes the channel’s new positioning and creates an environment that the audience can instantly familiarise with despite the virtual setting. Creating realistic sets was part of the brief, in this instance it was a good design move. Our visuals were created in AutoDesk 3Ds Max, these were converted in house by ITN who use Viz to create their virtual environments. So far the audience reaction to our sets has been very positive. Most articles are predominantly focusing (positively) on the quality of the news output, the dynamic of presenters and the delivery, our central objective from the offset. 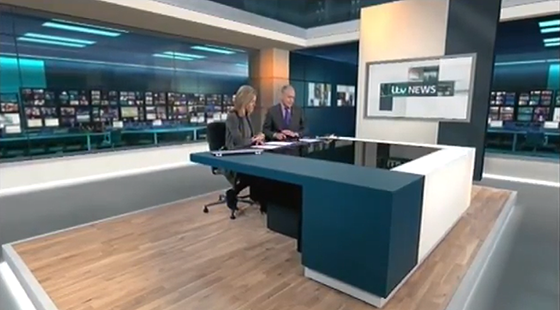 You can read NewscastStudio’s full reaction to the new ITV here.